Wooden casing and Capping Wiring Points : Wooden casing and Capping Wiring system The cables used in this type of wiring is either VIR or PVC or any other approved insulated cables. The cables are carried through the wooden casing enclosures. 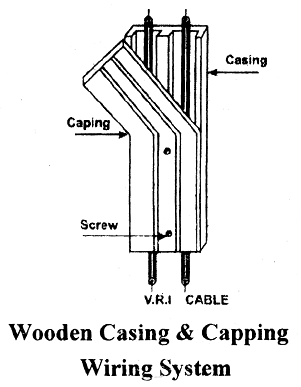 The casing consists of V-shaped grooves (usually two to hold the cables of opposite polarity in different groves) and is covered at the top by means of rectangular strip of wood, known as capping of same width as that of casing. The capping is screwed to the casing by means of 13 mm x 4 wooden screws fixed at every 15 cm on the centre fillet. To protect the casing against white ants first class seasoned teak wood varnished by shellac varnish is employed. Two or three cables of same polarity (either all phases or all neutrals) may he run in one groove and in no case the cables of opposite polarity should be run in the same groove. The casing is usually placed 3.2 mm apart from the wall or ceiling by means of porcelain distance pieces of thickness not less than 6.5 mm in order to keep the casing dry at the back. The wooden gutties on which the casing is screwed by means of 32 mm x 8 wooden screws are fitted into walls or ceilings at intervals not exceeding 90 cm for sizes of casing capping up to 64 mm and not exceeding 60 cm for sizes more than 64 mm. The sizes of the casing capping to be used depends upon the number and size of cables to be accommodated in any particular length of run. The table Ii showing the number of cables of different sizes, which can be accommodated in each groove of different sizes of casing capping are given. The length in which casing capping is available. varies from 2.5 meters to 3 meters. How Does Earthing Give Protection? Why is Earthing So Important? What Points are To Be Connected To Earth?